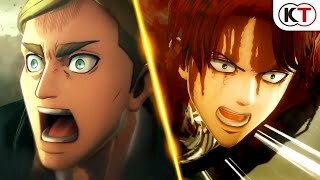 3/14/2019: Taking place during Attack on Titan Season 3's timeline, Final Battle's Story mode plays through selected characters' points of view with major heroes active in Season 3. 3/20/2018: Fly into battle against devastating titanic foes. 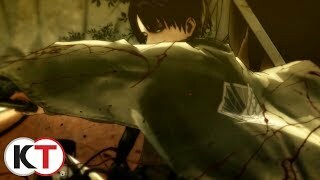 3/15/2018: Experience the chaotic battles against Titans through the eyes of a custom created Scout. 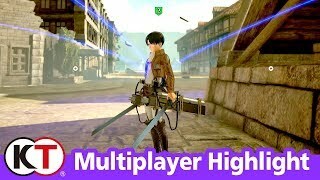 3/2/2018: Get a first-look at Annihilation Mode, a 4v4 mode where Scouts compete for the highest score by defeating Titans and capturing bases. 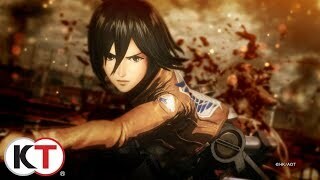 3/2/2018: Fight alongside Eren and Mikasa against swarms of Titans to rescue your squad mates from peril. 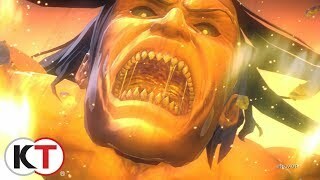 12/4/2017: Titan's attack and reveal the game's release date. 11/16/2017: New combat mechanics on display.